Cookies may be used on this site to enhance your experience. Want to stay up to date with our upcoming productions? 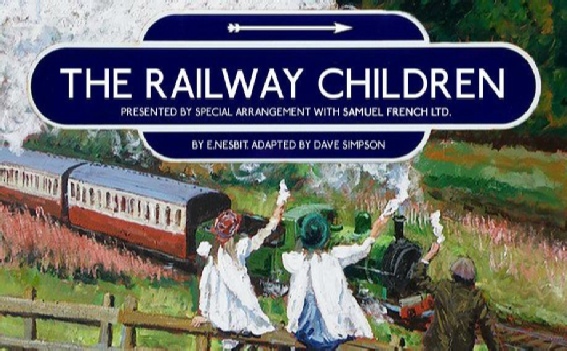 Our November 2014 staging of Dave Simpson's adaptation of E Nisbit's classic story of The Railway Children proved very popular with audiences. "Tonight’s production had laughs, miracles and wonder, and made one long for the period when we had the time to wait and wave at passing trains, and join in with the excitement of a paper-chase. The final scene in which Roberta is finally reunited with her adored father...was a fine tearjerker to start off the festive season. An enjoyable evening’s entertainment." "The first thing one has to mention is the staging and the clever use of space. One did wonder how this adaption would be created in the church hall and I was not disappointed. The set was kept simple but imaginative enough to convince you of where you were.,,,,,The train arrivals and departures were simple but very effective and the excellent sound, lighting and steam made you believe you were actually at the station, with its cream and green paint, signal box, and white fence, in the distance a lovely painted perspective of the rolling green hills behind the station." "Director Jill Gill should be commended for her ability to combine a varied age range of actors.....all three of the actors playing the central children's parts were strong and utterly convincing..."
"A scene stealer was when the children averted a serious rail crash due to a landslide. The blasts of steam and thunderous sound effects were presented with great theatrical flair as Roberta and the children stand in the middle of the line before the tunnel waving petticoats. The audience looked behind believing there to be a real train hurtling towards the stage!"